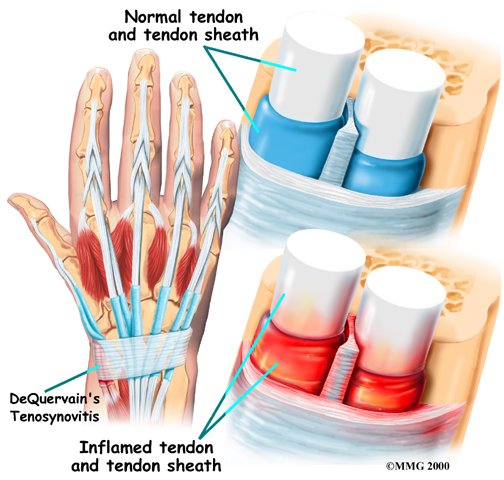 De Quervain’s disease is an inflammation to the tendon of the wrist. You will experience pain at the side of your wrist and the bottom of your thumb. You may get de Quervain’s disease when you use the thumb or wrist too much. It is also commonly known as “mummy’s wrist” as de Quervain’s disease usually happens to mothers who often carries the baby and injured the tendon. Lifting heavy objects such as a jug of milk or lifting a baby. Women are more likely to get de Quervain’s disease more than men. De Quervain’s disease affects people between the age of 30 and 50. If you are having de Quervain’s disease, you will feel extreme pain when you try to twist your wrist. The pain is worse if you grab something between your thumb and finger. The bottom of the thumb or the side of the wrist may get swollen. Moving your thumb or wrist may increase pain. If you ignore, the pain can radiate to your forearm or down to your thumb. Physically examination will include checking for swelling or tenderness around the base of your thumb. Finkelstein test will help to diagnose de Quervain’s disease. The treatment for de Quervain’s disease is to help to reduce the pain and you can resume back to your daily activities pain free. If your symptoms are not better after the above conservative treatments. Surgical intervention maybe needed to to release the tendon sheath. Call +65 6471 2674 to make an appointment to see our orthopaedic specialist for your de Quervain’s disease.